Sow extra because you never know if the fall will be a mild one or not. A few extra warm weeks in October, November and even December can mean crops have more time to mature, can go later into storage, or can be protected longer under cover. Several of the seed companies have segments in their catalogs or even separate catalogs to order late season and over wintering crop varieties. Read their descriptions carefully. Go heavy with tried and true types and experiment with a few new ones to see how they work. Some catalogs are from areas of the country where winters are milder so take their descriptions and planting dates with a grain of salt. We need to have things going at a tough time between hot Augusts and Septembers to cold cloudy wet spells in October. With diminishing sunlight, every cloudy day is like losing several sunny days making reaching maturity that much harder. Set up plantings into beds and after last cultivation, put up low tunnel or Quick tunnel hoops. 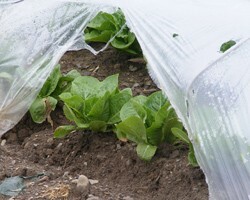 This will save time later if an early frost is forecasted and you have to cover things in a hurry. If you are using row cover, you probably still have it laying in the aisles next your early planted beds. Pull it out of there, dry it off, roll it up, and put it where you can get to it next fall. Put your sand bags set aside near the beds covered to protect them from the sun. Fill more to replace any old torn ones. For kale, Swiss chard, cutting celery, and parsley, it might be a good strategy to get these crops started early, like now, so that you have large ready-to-pick plants going into the fall. Growth often slows down on later season plantings especially when the weather is cloudy. These are big plants that can take up room and if they are not ready to produce, they are costing you money. A planting schedule chart arranged by crop is provided below. It includes days to maturity, harvest date range, seeding date, transplant date, key notes, and over-wintering information. For more information or if you have any questions, please contact Robert Hadad, Cornell Vegetable Regional Specialist.